We transformed the way a hospital fundraises. The lifeblood of Rochester General Hospital and its affiliates, fundraising done by the Foundation largely relied on the individual efforts of a small staff and mix-and-match campaign support. A robust, resource-full website became the centerpiece of successful fundraising efforts, surrounded by social media support, collateral, events, direct marketing, and an emotionally, materials-charged, campaign video. 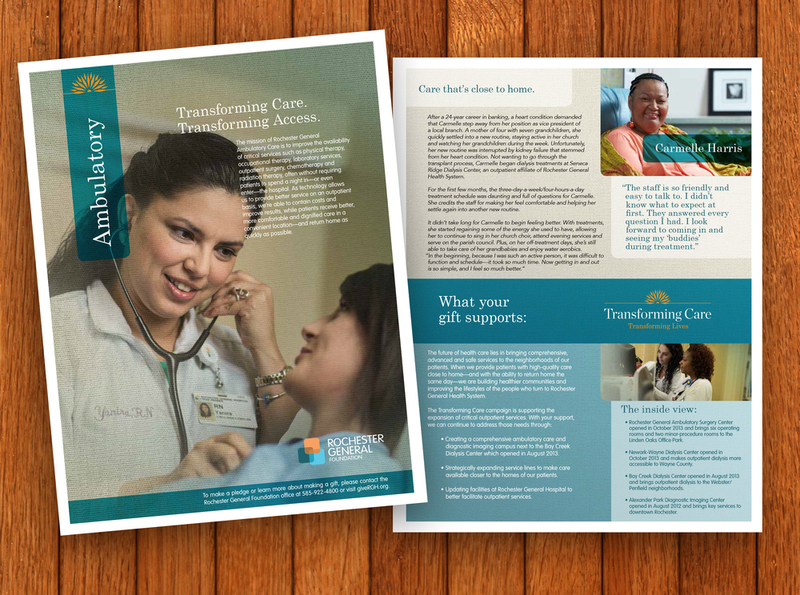 In support of the brand new RGHF website, and as an integral part of the face-to-face fundraising efforts of the Foundation staff, a series of brochures were developed to use as presentation support pieces, featuring department-specific donation needs and Grateful Patient stories.